Laura Ingraham is the most-listened-to female talk radio host in the United States. The Laura Ingraham Show is ranked in radio’s TOP 5, heard in hundreds of markets coast-to-coast, and is the third-most-streamed show in the country. Laura is the author of numerous New York Times bestsellers including Of Thee I Zing, The Obama Diaries, Power to the People and Shut Up & Sing. As the primary substitute host on The O’Reilly Factor and Fox News contributor, she is among the most prominent political and cultural commentators in America today. Laura is a former white collar defense attorney with the prestigious international firm of Skadden, Arps, Slate, Meagher & Flom and a former United States Supreme Court law clerk for Justice Clarence Thomas. In addition to her national radio program, Laura Ingraham has been active in cable and broadcast television. She has worked as a commentator for CBS and hosted shows on MSNBC and Fox News. 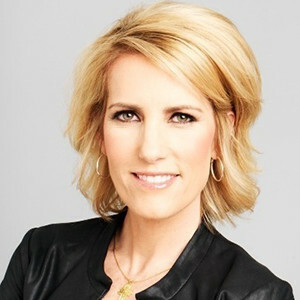 Ingraham graduated from Dartmouth University, where she contributed to the famed Dartmouth Review conservative newspaper. She later went on the earn her J.D. from the University of Virginia School of Law. She resides in Washington, DC with her three children Maria, Dmitri, and Nikolai. Laura is a passionate promoter of domestic and international adoption, and a stalwart advocate for our military men and women.